2.Sign up your Account on FreeCharge. Terms & Conditions:-Valid on successful Recharges/Bill Payments till 15th Jan 2016Valid on Min Recharge of Rs.75. 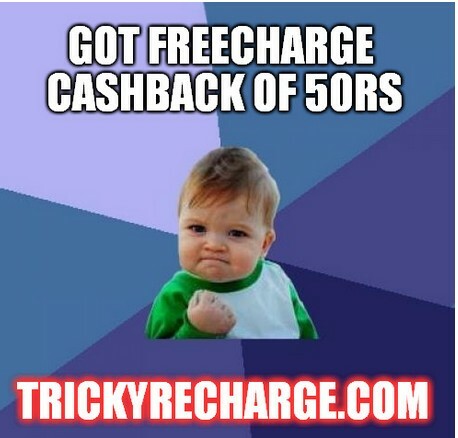 Max Cash back of Rs.50FC75 Promocode has to be applied to avail cashback offerValid only Once per New User/Credit/Debit Card/Mobile Number.Valid on credit/debit card /Netbanking transactions onlyCashback will be credited to your FreeCharge Wallet which can be redeemed within 185 days from date of credit, and is non transferableNot Valid for Add Cash Transactions and transactions done via FreeCharge BalanceOffer not valid for Airtel transactions.Offer valid on FreeCharge App, Web & mWeb.